Does taking photos of your food and posting them to Instagram, Twitter, or whatever else make it taste better or worse? 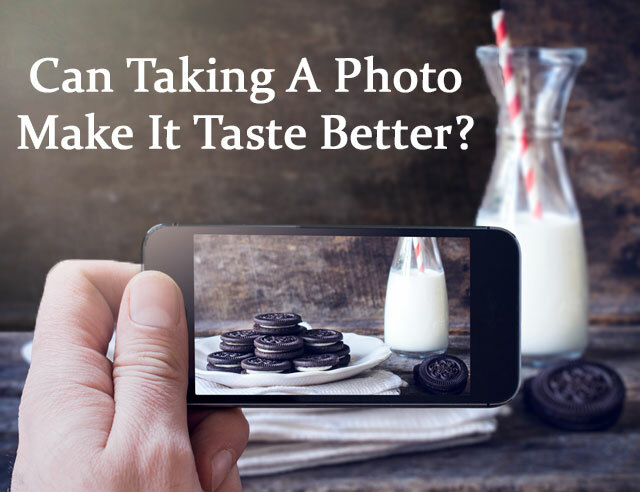 Surprisingly, this isn't just a matter of opinion: more than one study has been done on the correlation between food photography and food taste. So just what will make your meal taste better? A new study in the Journal of Consumer Marketing says that taking the time to photograph your meal before eating it may actually make it taste better. By taking the time to pause—and snap the perfect photo—before diving into a meal, you have a chance to savor the delicious meal you're about to eat. Then, when you do take a bite, it tastes better. But according to the same study, this trick only works with "indulgent" foods. When study participants were asked to photograph a red velvet cake before eating, they thought it tasted better than those who didn't photograph the cake. But when asked to do the same with a fruit salad, all participants felt the salad tasted the same, whether they photographed it or not. Looking at photos is a different story. A 2013 study from the Journal of Consumer Psychology found that people who looked at photos of peanuts before eating peanuts, enjoyed eating the peanuts less. The photo itself satiated their desire for a salty snack, and so the peanuts simply didn't taste as good. However, when study participants looked at sweets and then ate peanuts, the peanuts tasted better—so only looking at the same type of food seemed to have this effect. However, if you consider health food, there's yet another aspect to the Instagramming dilemma. Even though the 2013 study found that looking at photos of food decreased your enjoyment of similar food, this new study suggests that looking at photos of healthy food or being told others are eating healthy food made them more interested in healthy food—and when they did know others were also eating healthy, snapping that Instagram shot before eating helped them enjoy it. In this case, instead of anticipating and savoring the experience of eating delicious food, you’re savoring doing something healthy, which has a similar impact on your enjoyment of what you’re eating. So reading through healthy food blogs and scrolling through the #cleaneating tag on Instagram could help you eat healthier. But there's still a bigger problem with Instagramming your meals: Dr. Valerie Taylor, chief of psychiatry at Women's College Hospital at the University of Toronto, suggests that photographing your food may be signs of an unhealthy obsession that could lead to obesity—especially for those with or with a predisposition for weight disorders. In the end, if you want to enjoy an indulgent meal just a little more, it's worth pausing to take that snapshot. But when it comes to browsing photos of cupcakes on Instagram, it probably won't make you enjoy a cupcake any more. And regardless, it's best not to obsess too much about your Instagramming. I think it definitely has an impact on how a photo of food plate is seen. I would pick a good recipe from a food and health website based on the quality of food and recipe.